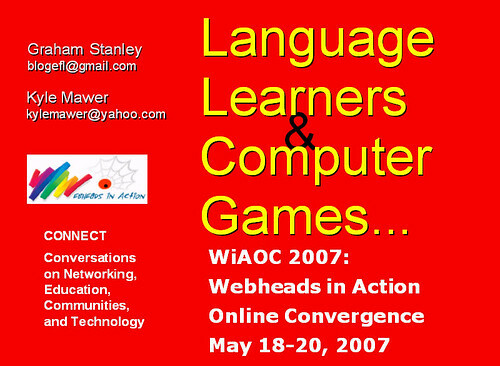 Kyle Mawer, my colleague and co-presenter at WiAOC2007 has started a wiki where he has been adding more ideas about the exploitation of computer games (especially free online games) for language learning and teaching. 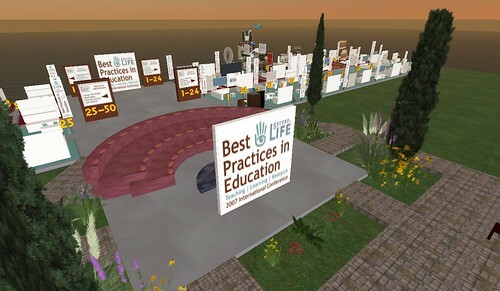 Why give a Power Point Presentation in Second Life? 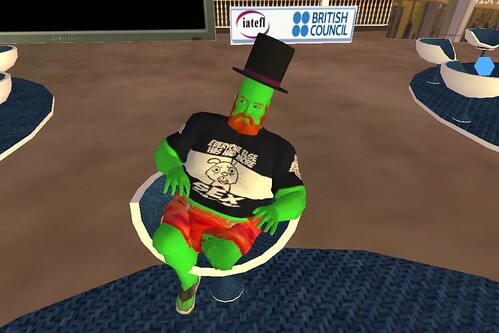 There's an interesting discussion going on in the Webheads list about replicating Real Life (RL) features in Second Life (SL) . There are lots of interesting points here (why put roofs on buildings, add stairs, etc?) and whilst I agree totally that SL becomes more interesting when you don't try to replicate the limitations of RL, I do think there are occasions when showing a Power Point presentation, for example, is valid. Crowd control - when you have a lot of people together in the same sim, moving about, running animations, etc you get something called 'lag' in SL, which means that things slow down. That's why there are seats too - you can have more people on a sim if those people aren't walking around and moving. Essentially what this means is that you're using SL as a visual chat room (a bit like a 3D version of Alado or Elluminate), but I like this, and it's particularly appealing when you turn on the 'Show Chat Bubbles' feature (from the Edit->Preferences->Chat menu). This feature makes for some interesting snapshots too, if you include the chat bubbles in the snapshots. Speed / Chaos - the point to most of the presentations at this conference is essentially 'show and tell', and people will be (with audio) presenting ideas that for the most part will be complemented by a picture. The same is true here as in a RL conference - why do we usually ask people to sit and show people slides there? Becuase it's often the best way of getting a point across. Could be the same in SL (depends on what you're presenting I suppose). Of course, once you've started, you could always give people a landmark and take them on a tour, and I'm sure many people will do this, using the presentation area as a meeting point. In our case, however, we can't take people on a tour (a great idea, that I would do if I could) as our project is not accessible to non-teenagers (it being on the Second Life Teen Grid) so we have to show people still images or video. You'll see that apart from the screen / seating area, there is also a vendor/booths area that looks just like a similar space in a RL conference! This I found very interesting, but once again - with so many people due to participate, making it this way does have its logic. Slideshare is a great tool for sharing presentations too. It's easy to embed the resulting slideshow on your blog, etc., and the site has social software/community tools too (you can send other users messages, post comments, choose slideshows as favourites, add slideshows to your library). It does have one problem though - once uploaded, it doesn't seem like you can delete a slideshow (or at least I tried to find out how to do it and failed miserably - I uploaded the wrong version of a presentation and wanted to replace it with another one) - so, be sure that what you upload is something you don't mind being there forever. So, my question is, 'What's the best way of displaying a presentation online?' Not only if you want to give people access to your presentation after the event, but also when you are giving the presentation live. There are now so many different ways of doing this, that it's difficult to choose which one to use. 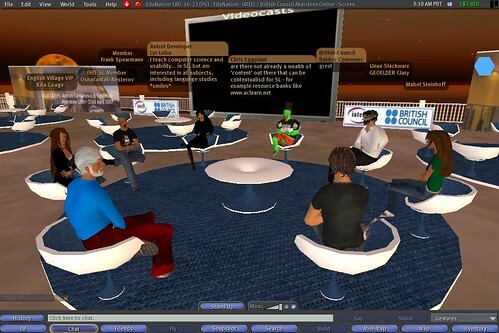 For example, we used the Elluminate virtual classroom for our live presentation on Gaming & Language Learning last Friday, using Learning Times. But, it might not have been the best way of showing people our slides (see post below). Of course, there are advantages to using this type of platform - the recording is done automatically, and the images are shown at the same time as the audio. 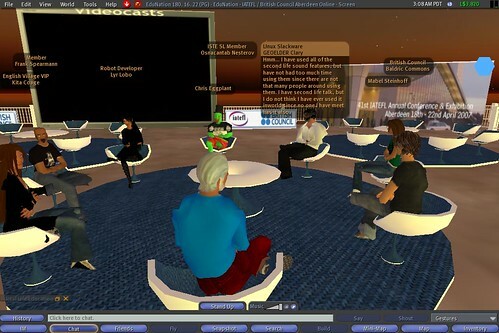 During the WiAOC, this virtual classroom option seems to be the most popular option, but there have been various alternatives used. For instance, Leigh Blackall's excellent keynote used a Flickr slideshow. The audio was provided by a World Bridges webcast & Skypecast, and it seemed to go very well. Apart from this, there's Bubbleshare and Slideshare too, and I'm sure many other tools (you can provide the slides as a video, with a voiceover). So, I'm going to upload our presentation to a few different tools to compare them. I want to see how easy it is to upload the files, and look at the quality and feel of the presentation when using them. This will make it easier to decide the next time I have to do a presentation. The Webheads in Action Online Convergence (WiAOC 2007) is now well underway, with so much activity going on it's impossible to keep up. Fortunately, most of it, if not all, is being recorded, so we can go back and listen and watch to the presentations that we missed becuase we were too busy to attend them live, or because time zone factors made them impractical to attend. we end up changing the format every time we do it: adding or removing slides, etc. It's also been interesting to see how we have decided to change the pitch depending on the audience and how the experience has differed because of the participants and the venue. Of course, yesterday was the first time we presented it online, and that in itself led to additional challenges and a totally different dynamic. One thing that was very different was not actually showing the games themselves, which we normally do when we've presented this f2f. prepare as much as you like, but you can never prepare for the unexpected! and we couldn't see any of the slides. Fortunately our audience could! Elluminate interface, which made things a little awkward. (bluetooth) headphones cut out, so I had to scramble for another pair. over, but it was a lot of fun. You'll need to create an account (free) to access the Learning Times recording, but this is well worth it - the community has lots of very interesting resources, and you'll meet some great people there. Background: To demo Second Life at the British Council stand at IATEFL, I (Baldric Commons) had to squeeze into a closet (for various connectivity reasons that aren't worth going into). 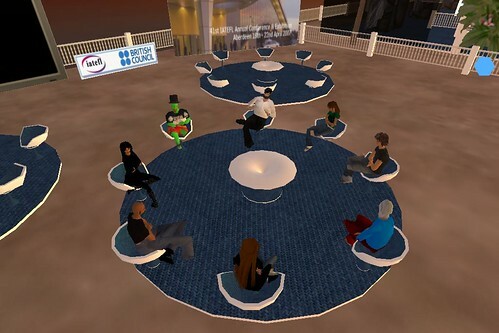 As I took part in the chat, a small crowd of people would appear, and so I'd come out of the closet to talk to them, and then pop back in to chat with the participants in SL. 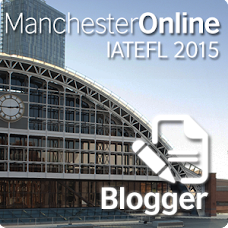 The chat drew a lot of observers at IATEFL. Kyle Mawer (Frank Spearmann), my colleague, was in an Internet cafe in the centre of Aberdeen, and he also drew a crowd of interested onlookers - many people in the cafe who'd seen Second Life on TV and wanted to know what it was all about. [2:38] Osnacantab Nesterov: Hi one and all. I am only virtual. No haggis for me. [2:39] Frank Spearmann: we've always suspected. Was it the gay gordons last night? [2:39] Osnacantab Nesterov: I do, ut my bank manager was unhelpful. [2:39] Baldric Commons: what do you teach, Kita? [2:40] Frank Spearmann: have you got a crowd there? [2:40] Osnacantab Nesterov: I joined (I)ATEFL in its first year of existence. [2:41] Osnacantab Nesterov: Look, you seated ones. It is a right click for gettings rears on chairs, isn't it? [2:41] Baldric Commons: did you go to the first conference? [2:42] Baldric Commons: welding and English, kita? [2:42] Osnacantab Nesterov: I didn't attend the first conference, and I have been a member on and off - not the whole period. [2:42] Baldric Commons: are you teaching at the English village in Second Life? [2:44] Baldric Commons: chris, are you wearing your fab t-shirt? [2:45] Chris Eggplant: so what's the gossip then! [2:45] Frank Spearmann: so what,s on the agenda for today then? [2:46] Baldric Commons: Frank, could you lead the discussion? [2:46] Frank Spearmann: well . . .
[2:46] Osnacantab Nesterov: Sorry for walking on the table..."Sit here" only occasikonally appears when I right click. But let's eave that topic. Dennis Newson, retired, formerly University of Osnabrueck, Germany. Hi. [2:46] Frank Spearmann: is that going on the moodle baldric? [2:49] Chris Eggplant: well interesting - most of my 'educational' career has been with very informal education, often with those most disenfranchised from the formal educational 'establishment'. I have also been leading in Becta on how technology can support the personalisation of learning and obviously SL has some huge opportunities - my only real issue at the moment is the technology requirments for both learners and staff etc. [2:50] Chris Eggplant: I am just now putting together a space to think more about how the 'informality' and 'skills' required in SL could be adopted as perhaps SL's first 'qualification framework'. [2:51] Osnacantab Nesterov: Do you see SL as playing just a supplementary role in language learning, or could languages be learned on SL? [2:52] GEOELDER Clary: Kita, good to see you. [2:53] GEOELDER Clary: I am interested in the immersive nature of language learning in SL. I work as an online teacher at an cyber language institute. I from the USA, but live in Costa Rica, America Central. [2:55] Frank Spearmann: Costa Rica great! camped at the base of an active volcano there. [2:55] GEOELDER Clary: Nice to meet you all. [2:55] Frank Spearmann: How long have you all been in SL? [2:56] GEOELDER Clary: Grea! the volcanos have been even more active recently. [2:56] GEOELDER Clary: A few months now. [2:56] Frank Spearmann: How busy are you all here? [2:57] Chris Eggplant: come and have a seat! [2:57] GEOELDER Clary: I spend time inworld, but really just looking around and playing. [2:57] Frank Spearmann: To what extent has your play been educational geoelder? [2:58] GEOELDER Clary: Some what . A lot of looking around thinking about how these different places could be used as educational tools. [2:59] Frank Spearmann: and what conclusions have you arrived at? [2:59] GEOELDER Clary: Hold on a moment. I am afraid I have a call. [3:00] Baldric Commons: have any of you tried to teach or learn languages in SL? [3:00] Osnacantab Nesterov: I have tried to find someone teching language on SL, but have not been successful. [3:02] Osnacantab Nesterov: That's good, Baldric. [3:02] Chris Eggplant: I think you are right Baldric - it does seem that there are a lot of people on a steep learning curve with SL 'preparing' the way and getting their own 'heads' straight on how it could be use. [3:02] GEOELDER Clary: Well, without sound, I feel language learning is very limited, but I do spend time in world in the Spanish speaking community which is in a way learning language. [3:02] GEOELDER Clary: I am really looking forward to the addition of sound. [3:02] Mabel Steinhoff: Skype is not working ? [3:03] GEOELDER Clary: Yes, it works, but not many people use it. [3:03] Osnacantab Nesterov: Baldric, you mentioned last night that there would be integrated sound in SL in Jujne/July. Is that correct? [3:03] Lyr Lobo: hmm, at the English village? [3:04] Baldric Commons: have you tried it out, Lyr? [3:04] Chris Eggplant: but will it be able to be used by a large percentage of residents - purely thinking of bandwidth issues and whether it will become the new chaos as to some extent chat is now? [3:04] Baldric Commons: can anyone try it? [3:04] Baldric Commons: sounds wonderful - how do we get involved? [3:05] GEOELDER Clary: I think if you look in the Linden blog you will see some instructions on how to use it on the beta grid. [3:06] Baldric Commons: Would the people who haven't already done so like to introduce themselves? [3:06] You: Lyr you are a game designer in SL, are you thinking of using those skills for educational purposes? [3:06] Osnacantab Nesterov: Baldric. What about Ventrilo. Does that work here? [3:06] Baldric Commons: Lyr, have you worked on any language learning games? [3:07] GEOELDER Clary: Hmm... I have used all of the second life sound features, but have not had too much time using them since there are not that many people around using them. 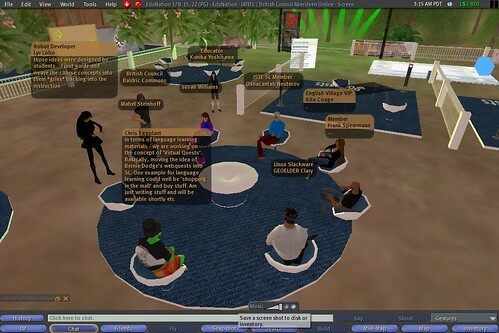 I have second life talk, but I do not think I have ever used it inworld since no one I have meet has it also. [3:09] Chris Eggplant: in Education UK, we have set up ventrillo and each space - has its own 'channel'. This means that, for example 'classroom 1' has a classroom 1 channel - which is password so only those in the class can communicate and we don't end up with the cast of Ben Hur trying to get in! [3:11] Baldric Commons: welcome, Susan! [3:11] Lyr Lobo: by content, what kind do you mean in particular, chris? [3:11] Baldric Commons: would you like to sit down? [3:11] GEOELDER Clary: Could you tell me a little about the games you have developed, Lyr. [3:12] Kunika Yoshikawa: mai take your seat? [3:14] Baldric Commons: wow, what was that? [3:14] GEOELDER Clary: I have tried to get up an sit on the floor to allow others to sit on the seats but that does not seem possible. 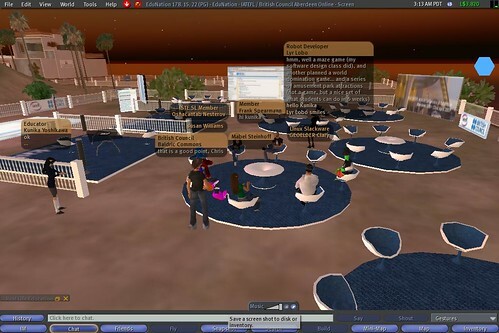 [3:14] Baldric Commons: are you learning English in Second Life? [3:14] GEOELDER Clary: Lyr, the games sound really interesting. [3:16] Frank Spearmann: I hear role playing is used here in language learning. Anyone know any more? [3:16] GEOELDER Clary: Chis, those are the type of activities I have been thinking about. [3:18] Mabel Steinhoff: true, Chris! [3:18] Osnacantab Nesterov: Webquests in SL sounds an exciting idea. You could hide clues all over SL. [3:19] GEOELDER Clary: But at the same time, technology might open learning spaces not thought of by those less technological evolved. [3:19] Mabel Steinhoff: will you bring it here, Chris? [3:20] Kunika Yoshikawa: discussion ? [3:21] Kunika Yoshikawa: how about talking? [3:21] Osnacantab Nesterov: Or a Jakuzzi. Every time you solve a clue you must take a photo of where you found it. [3:22] Chris Eggplant: yes! exaclty - that's the spirit eveyone - glass of wine all around!!!!!!!!!!!! [3:24] GEOELDER Clary: I also think that simple things like field trips can be fun. [3:24] Mabel Steinhoff: will we get to know somehow, Chris? [3:24] Osnacantab Nesterov: As someone said earlier, or implied, we, the tutors, educators whatever need to get to know SL as it is very well. I still cannot walk properly or sit down reliably. We culd do with an educational tour of the island. [3:25] Frank Spearmann: how do people here address sceptics in RL of SL? [3:25] Kunika Yoshikawa: glass of wine? [3:25] GEOELDER Clary: There are interesting museums to visit with plenty to stimulate speaking. [3:26] Osnacantab Nesterov: Convincing people of the potential of SL is very difficult indeed. [3:26] Baldric Commons: would you like to do a chat about this siometime chris? [3:28] Misha Writer: hi - have I missed it? stimulating ideas th think through. Thak you all. [3:28] Mabel Steinhoff: bye, Dennis! [3:29] Misha Writer: no, doesn't matter, not just for me - but will there be a transcript of last night & this morning? [3:29] Mabel Steinhoff: sorry I coudnt attend yesterday, got my message, Baldric? [3:30] GEOELDER Clary: Is IATEFL another list serve in SL? [3:33] Lyr Lobo gave you Hot Coffee. [3:34] Lyr Lobo gave you Topeka Coffee mug. [3:35] Misha Writer: Susan - what would a quest consist of? [3:35] Cup Of Green Tea whispers: Ah! Steaming Green Tea! [3:35] GEOELDER Clary: Are people planning on attending the inworld conference on Best Practices? [3:36] Lyr Lobo: would anyone like a beverage? [3:37] GEOELDER Clary: I best join Webheads. [3:37] Misha Writer: can you email me when you've got the details? [3:38] Frank Spearmann: on these quests? treasure hunts, how would you use audio and text? [3:39] GEOELDER Clary: I am going to have to leave. I have to resolve if I am actually teaching at five CA time. [3:39] You: would there be a prize? reward other than the task itself? [3:39] GEOELDER Clary: I appreciate meeting everyone. [3:40] GEOELDER Clary: Susan, and is the bewwt way to find out about them through webheadS? [3:40] GEOELDER Clary: Hope to see you again Kita. [3:40] GEOELDER Clary: could I have the email again. It got by me. [3:41] GEOELDER Clary: Good bye everyone! [3:41] GEOELDER Clary: Hope to run into you all inworld. [3:43] Misha Writer: Frank - I'm hoping to get an idea of how people think the SL environment can be used in Language Learning - approaches, activities ..
[3:44] You: besides building a community of english speakers how do people see that being achieved? [3:45] Lyr Lobo: do you mean class activities and approaches or for researching new ways to teach languages? [3:51] Misha Writer: Baldric - are you shooting at me? [3:52] Baldric Commons: Frank, can you email me this transcript? [3:52] You: how about mini presentations on notecards? [3:53] Kita Coage: how can you save the chat? [3:53] Misha Writer: question - can I save a transcript myself? [3:53] Misha Writer: same question!! [3:54] Misha Writer: where do you pick up the chat log? [3:55] Yenamous Boa: at what time ? [3:56] Frank Spearmann: I just look for someone who looks like your avatar, right?